For the majority of us, a lot of our daily lives are taken up doing things we’d prefer not to be doing, but must: commuting, ironing, food shopping, or whatever it is that you resent doing because it keeps you from important things like reading. But as reading a book while driving is understandably frowned upon, audiobooks are a great alternative for an entertaining commute, and way more exciting than the standard “adverts...adverts...news...adverts…” game we all end up playing with the radio, as well as being a great hands-free option that livens up almost any task. So you know why you should listen to audiobooks, but which ones? Well, defining the “best audiobooks” is pretty difficult. 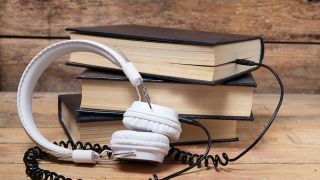 There’s preference of genre, narrative nuances, personal interpretations, and likes and dislikes both big and small that all make it hard to find a one-size-fits-all conclusion in the quest for the perfect audiobook. What we can do is offer highly regarded titles from across a variety of genres, some with universal acclaim, some with the best narrators, some that are just… well, the aural equivalent of “unputdownable”. But when it comes to the practicalities, there’s a little more to consider, like how you get them, for example. If you have an Android or Apple device, you can download Amazon’s Audible app, where you can either buy books outright or sign up to a monthly service that gives you a credit for one free audiobook every 30 days. Protip: use that credit wisely. The two longest titles on our top 10 list are Stephen King’s IT and George R R Martin’s A Song of Ice and Fire, which, aside from being a great listen, will also get you the most bang for your buck. Alternatively, if you don’t have a smartphone or tablet but have access to a computer, bought titles can be downloaded to an MP3 player instead for listening at your leisure. Finally, it’s worth bearing in mind that some audiobooks will be the full unabridged versions of the entire text; some especially lengthy tomes will be cut down to a sensible length or partly dramatised for an extra immersive listen, so if you’re already a fan of a certain book and want to try the listening experience, be sure you’re getting the one you’re expecting. Philip Pullman's La Belle Sauvage has been one of the most hotly anticipated literary releases of the decade and by all accounts has more than met the hype - but in audiobook form, even the suspenseful and captivating story almost ends up playing second fiddle to Michael Sheen’s narration. Listeners loved the actor’s incredible range of emotion and dynamic, finding it easy to forget that each and every character was brought to life by a cast of one. Story-wise, it’s a totally immersive meeting of realism and, at times dark, fantasy, the precise formula that made the His Dark Materials trilogy such a success with young readers. In the style of its predecessors, La Belle Sauvage is a fantastic story for older children, and as an audiobook, it reaches new immersive heights. If you’ve already devoured the show but haven’t yet delved into the original books, this audiobook of A Song of Ice and Fire, the first book in the Game of Thrones series, is sure to be a treat. While the plot of the TV series follows almost exactly, the book adds extra depth and detail that fans will appreciate, especially in regard to the backgrounds of characters. Some found that the accents got a little weird in places, although to be fair to Roy Dotrice, we don’t envy him the task of keeping track of the unique voices of a cast of characters that may well be in the thousands. While Stephen King’s “thesis on horror” might have had a few more downloads of late thanks to its recent film adaptation, IT has long been a classic choice for readers and listeners looking to get a little spooked. This audiobook version has its own legions of fans, with reviewers commending narrator Steven Weber’s emotive, tension-building performance, and especially his “blood-curdling” Pennywise. At 44 hours, and with some at-times hard-going passages on the history of Derry and dual timelines that might catch you out if you’re not paying attention, it can be a bit of a slog, but for a chilling and far-reaching narrative like this one, it’s worth it. Another text that has enjoyed a recent reimagining for the screen, Outlander tells the story of combat nurse Claire Randall, whose accidental time slip from sees her transported from an idyllic second honeymoon in 1945 to a world of violent clan warfare in 18th-century Scotland. Admittedly, it’s a bit of a bodice-ripper, and those in search of serious, and seriously accurate, historical fiction might prefer to go the Robert Harris route. But to call it Chick Lit is to do it a huge disservice, because its intriguing mix of romance, history and science fiction - not to mention Davina Porter’s fantastic narration - is a winning formula that’s kept reviewers on tenterhooks. The persistent success following the book’s original publication in 2003, even spawning a critically acclaimed West End show, is proof positive that The Curious Incident of the Dog in the Night-Time is a darn good read. This partly dramatised audiobook version, featuring some background music for added atmosphere, has rightly earned its own group of fans, with reviewers finding themselves engaged by the characters, the narration, and the sensitive insights into a young mind struggling with the challenges of an Aspergers-like disorder. The choice to cast a young voice actor in the role of Christopher Boone is a spot-on one, adding a touch of absorbing realism. While it’s generally expected that an audiobook autobiography might reasonably be narrated by its author, the same in novels is really quite rare, which is one of the things that make this edition of John le Carré’s A Delicate Truth such a delight. After all, who’s best placed to bring characters to life than the person who wrote them? The appeal doesn’t stop there though, as you’d expect from a modern master like le Carré, the story itself is gripping, intriguing, and thought-provoking. The only downside is that, what with all the espionage, it can be a little hard to keep track of if listening in short bursts, so you might want to carve some time out to give it a really attentive listen. Not only is it widely known that Barack Obama has one of the most soothing voices known to man, his story is some stirring stuff, too, so combining the two in Dreams from my Father is surefire audiobook magic. Taking the listener on an audible odyssey from Kansas to Hawaii, Indonesia to Kenya, this autobiography is raved about by listeners for its inspiring story, full of insight into the politician’s remarkable life, his hopes, and his struggles with identity, and with a humanising aspect that’s largely unrivaled in other books penned by politicians. If you miss Barack as much as we do, or if you’re just in search of an inspiring autobiography to give you a bit of a boost, give this a go. Oh, and it won a Grammy. What’s not to love? One for fans of The Mindy Project, this autobiographical audiobook gives listeners an insight into the life of actor and comedian Mindy Kaling as read by the woman herself. From musings on funeral planning to reminiscing about being scared of her own bicycle, listeners are taken on a witty, self-effacing and laid-back narrative journey through episodes from the author’s life, and while those unacquainted with Mindy might find her trademark tone a little grating at first, we’re yet to find anyone immune to falling in love with her a little bit. Plus, unlike many audiobooks, this one refreshingly offers interjections from other voices to keep things fresh. For a light listen on your lunch break, this is a great choice. If you’re a little tired of the cotton wool-wrapping approach and fluffy self-care advice that seems to have pervaded the blogosphere in recent years, you might want to give Mark Manson’s The Subtle Art of Not Giving a F*ck a try. Essentially a five-and-a-half-hour version of Alex Baldwin’s Glengarry Glen Ross speech covering everything that we, as average schlubs, should and shouldn’t be giving a f*ck about, it’s less of a reassuring touch on the arm and more of a violent shake by the shoulders. An entertaining and oddly freeing approach to the cares of the everyday, although roger Wayne’s narration, with its vehement emphasis on swear words and some cringey high-pitched imitations of women, won’t be for everyone. Heading on holiday? Check out our guide to the best Kindles and e-readers to keep your imagination whirring with back-to-back reading material all on one device.